The University of Washington is delighted to welcome visiting exchange students from our exchange partner universities and specific departmental exchange partner universities. 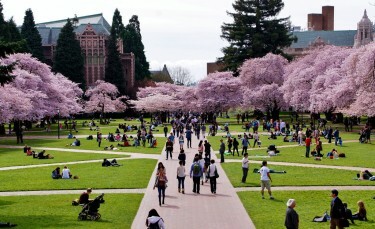 The UW is one of the world’s preeminent public universities. Our impact on individuals, our region and the world is profound — whether we are launching young people into a boundless future or confronting the grand challenges of our time through undaunted research and scholarship. Ranked No. 14 in the world on the 2018 Academic Ranking of World Universities, the UW educates more than 54,000 students annually. We turn ideas into impact and transform lives and our world. In the middle of one of the most vibrant and fastest growing cities in the USA. Close to some of the most breathtaking scenery and wilderness in America. Part of a robust international student community. In ordered to be considered for admittance as a visiting exchange student you must first be nominated as a candidate for exchange by the international office or corresponding department at your home university. Please contact your university’s exchange coordinator for questions about the nomination and selection process. If your university is not listed among our partner universities then we unfortunately cannot accommodate your request for short term study at UW. Please contact Undergraduate Admissions or Graduate Admissions if you would like more information about degree or transfer options for international students. Students interested in English language programs or research possibilities should contact the International and English Language Programs office.